"HIV positive patients with intracorneal precipitates between Descemet's membrane and endothelium" AAO-PAAO, Joint Meeting, October 24, 1999, 2nd Place Award- Select Free Papers at the Pan American Congress of Ophthalmology. "From Asia to America, How Bausch's Crisis Grew." The New York Times 2006 May 18. "Improving Vision with Artificial Corneas." FOCUS Issue 3, 2011. Dr. Chu received his Bachelor's degree from Bowdoin College. Afterwards, he graduated New York University School of Medicine and completed his ophthalmology residency at New York Medical College. After his residency, he undertook subspecialty training at the Massachusetts Eye and Ear Infirmary of Harvard Medical School, with a fellowship in Ocular Inflammatory Disease and Uveitis. At the Cornea and Laser Eye Institute, Dr. Chu specializes in corneal diseases and surgery with particular interest in inflammatory and immunologic conditions. In particular, he cares for patients with cornea problems and difficult to treat ocular conditions, including uveitis, scleritis and ocular pemphigoid. He has extensive experience with the use of chemotherapeutic agents in the management of ocular inflammatory diseases. In addition, he has special interest in new surgical procedures such as amniotic membrane transplantation and state-of-the art corneal transplantation procedures including DSAEK, DMEK, and anterior partial thickness corneal transplantation techniques. 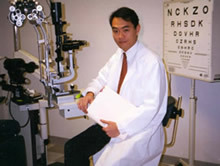 In addition to his work at CLEI, Dr. Chu is a Clinical Assistant Professor at the Department of Ophthalmology at the Rutgers - New Jersey Medical School. His research interests include corneal wound healing, surgical and non-surgical therapies of various ocular inflammatory diseases, and novel techniques of corneal imaging. Dr. Chu is also involved in a number of clinical research studies at the Cornea and Laser Eye Institute designed to evaluate the safety and efficacy of new drugs and techniques in the treatment of corneal and ocular inflammatory disorders.